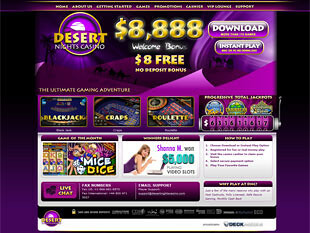 Desert Nights Casino opens before you the wide gates leading to the world of online gambling. 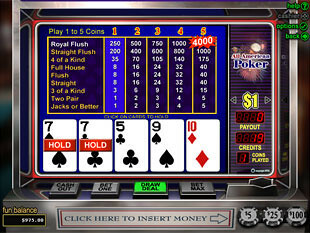 With this casino you can play many popular games including video poker, slots, roulette, blackjack and baccarat, all without leaving home. You only need a computer with Internet connection – and the amusing world of online video games is all yours. 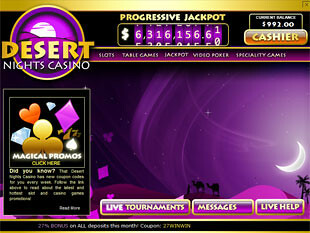 This casino was founded in 2010, but today it can already suggest you interesting bonuses, graphics and games choice. Here you can play over 170 games powered by the popular RTG platform, which means US players are are also welcome at Desert Nights. The average payout at this casino is 96.8%, so you have really great chances to get a good profit for playing favourite gambling games. Like most casinos that have recently entered the online gambling market, Desert Nights Casino offers you a nice choice of intriguing bonuses. Here you can receive the most popular type of promotions – $8 No Deposit Bonus. This sum is awarded to new players who claimed it from a cashier. The money you get has to be wagered at least 33 times, and the maximum cash-out is $50. Another amazing offer at this Casino is the $8,888 Welcome Bonus split into 6 first deposits. And there’s no trick – the wagering requirements are ok – for different deposits you’ll have to wager the added sum of bonus and deposit between 25 and 30 times. 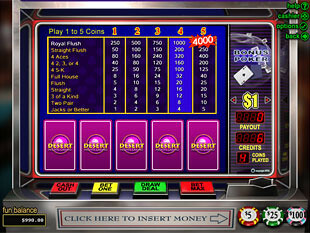 To play Desert Nights Casino, you need to go though several easy steps. First, you have to install casino software. After that you are suggested to register – just fill out a form with brief information about you. When the registration is over, you can choose Video Poker, Slots, Table Games, Jackpots or Specialty Games, and start to play. Also, you can try many Desert Nights games in no download mode. Every game type uncovers you many interesting options that will bring you a lot of joy. 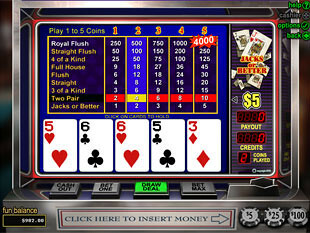 For instance, video poker fans can will certainly like Bonus Poker, Deuces Wild, Aces & Eights, Sevens Wild, Joker Poker, Jacks or Better and many other versions of this popular card game. 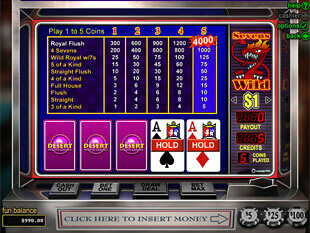 Also, many video poker at Desert Nights suggest you to play with 1-52 hands, which is good for risky treasure-hunters. All deposits at Desert Nights Casino are made instantly. To credit some money to your account you can use Visa, Master Card, American Express, MyPaylinQ, Moneybookers/Skrill, Neteller and ECO Card. First four options also accept US players. To make a withdrawal you can use MyPaylinQ, Moneybookers/Skrill, Neteller or ECO Card.